The Czech music audience first became aware of Bittova’s purely musical talent in 1987 after she and percussionist Pavel Fajt released a joint recording of very original minimalist fusion of alternative rock music with Slavic and Gypsy motifs. 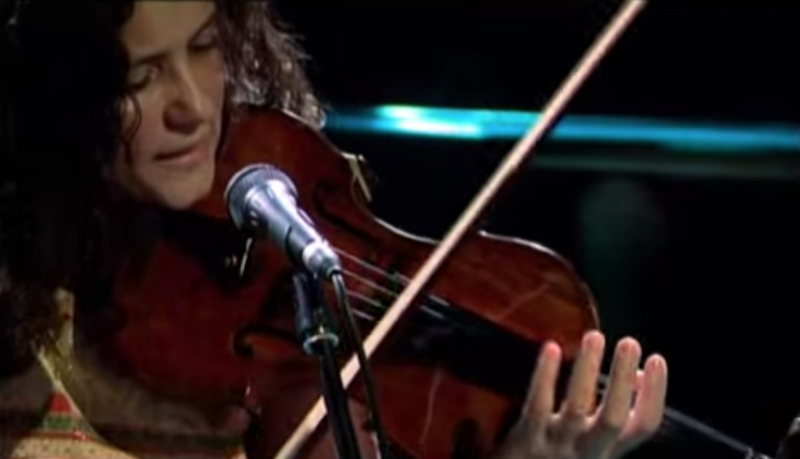 Iva Bittova‘s first solo record (“Iva Bittova” – 1991) fully outlined her extraordinary complexity as an artist. She composed all of the 14 tracks on the album, except for Czech folk song “One Sister”. “Her colourful voice scaled the octaves, intertwining with alternately warm, frantic and brutal tones emerging from her violin and viola, creating interesting musical landscapes with poetic lyrics that drifted quietly over them like clouds…” wrote The Prague Post about her first solo CD. Bittova is one of those rare artists who know how to put all possible extremes of the emotional scale into one song: she laughs and cries, cackles as a hen, chirps as a bird, slaps her tongue, makes strange throat noises and even lets all these vocal tricks coincide with a mime imitating madness next to childish surprise. Bittova’s violin playing is as impressive as her vocal acrobatics, distilled from different techniques, constantly mixed. She might pluck her instrument as a ukulele or a banjo,or play with a bow or a wooden stick to get a rhythmical pattern from the string. Bittova uses everything she has, plays with her entire body, beats a rhythm with her feet. Every now and then, she introduces performance-elements, thus provoking simple but beautiful images, making her concert more accessible. In addition to her solo concerts Bittova has collaborated and performed many concerts together with other famous musicians (Jiri Stivin, Emil Viklicky, Fred Frith, Tom Cora, Chris Cutler, David Moss, Pavel Fajt) and ensembles (S.E.M. Ensemble) both in the Czech Republic and in a majority of European countries and the U.S.A.. Bittova recently collaborated with the Nederlands Blazers Ensemble with whom she performed on Czech TV and in the Rudolfinium, home of the Czech Philharmonic. Bittova – drawing from a well of pure natural talent and Gypsy-Jewish blood – is her own individual – composer and actress – always searching for new and nontraditional shapes.